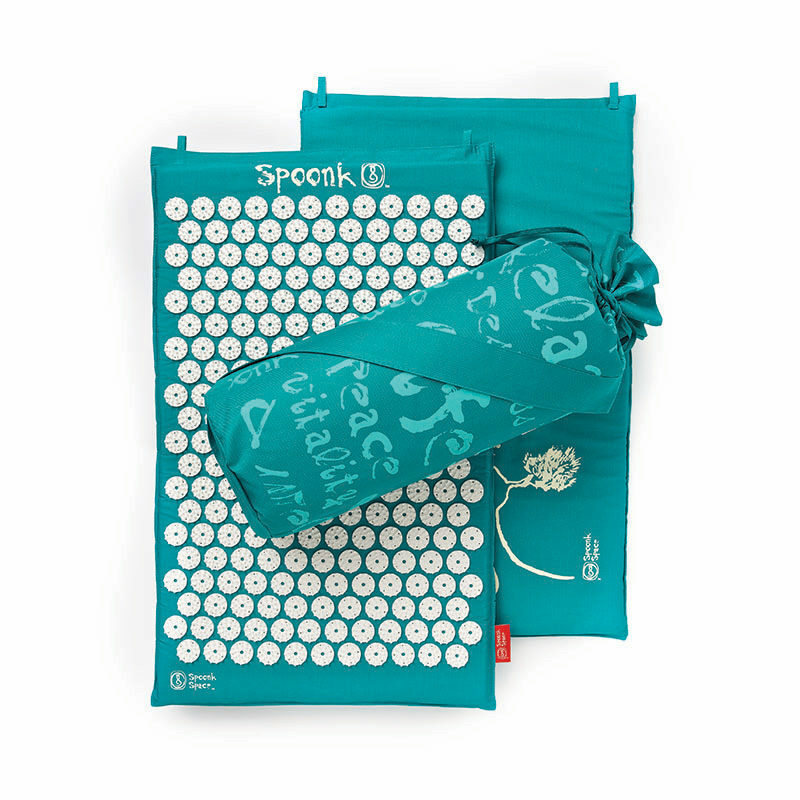 The Spoonk Mat works on the simple principle of acupressure - the healing art known as the Shiatsu massage. By stimulating increased circulation with 6210 acupressure points on problematic areas, you relieve muscle tension and pain, while at the same time rejuvenating and rebalancing the whole body. The stimulation points are made with high quality, non-toxic, hypoallergenic ABS plastic. Spoonk is the only brand that uses plant based, USA-made, CertiPur-US Eco-foam free from PBDE flame retardants and made using VPF technology. Our fabric is GOTS certified (Global Organic Textile Standard) and 100% cotton. • Lie down on your back against the Spoonk mat in your bed. We recommend direct skin contact with the mat for 20-40 minutes for the best effect. • The initially strong sensation of the stimulation spikes will subside after 1-2 minutes as relaxation spreads throughout the body, reducing stiffness and pain. A tolerance can be built up by gradually increasing the time on the mat. If you find the sensation too strong, we recommend you start with a T-shirt thin enough to feel the stimulation points. • Once you reach a deeper level or relaxation you are ready to remove the mat and go to sleep. Relaxation before sleep is crucial to achieve deeper and sounder sleep. • Deep sleep helps us produce the growth hormone which is needed to boost our immune system, help us look younger, and aid healing in general. •	Stand on the Spoonk mat for 3-5 minutes when you feel fatigued (we recommend wearing socks while standing on the mat). •	According to Traditional Chinese Medicine, our feet have specific reflex areas that correspond to the body’s organs. •	Reflexology foot massage has a rejuvenating effect on the whole body. •	Ideal for tired feed, Planter Fasciitis, and other foot ailments. • Position the Spoonk mat under your abdomen for 20 minutes. Wear a thin T-shirt due to sensitive skin in this area. • Abdominal massages help to relax the body and mind, as well as boost digestion and energy. • Instead of the snooze button, try lying on the Spoonk mat for 10 minutes in the morning! • You may start and end your yoga routine with 10 minutes of Spoonk massage to calm the mind and deepen the relaxation effects of yoga. • After any workout, you may wrap the mat around sore muscles to lessen stiffness. • Spoonk presses the stimulation points on the skin to increase circulation and aid in relaxation in the inflamed and painful muscle area. Spoonk provides the benefits of a deep tissue massage that lowers the “stress hormone” cortisol while releasing endorphins (or “feel good hormones”), decreasing anxiety and creating an overall more positive and relaxed sense of well being. • Spoonk relieves back pain and aids in deeper sleep. It can also relieve neck, hip, joint, foot, arthritis, and headache pains. • Spoonk products are produced with the highest environmental criteria in mind and are made with all natural materials. • Spoonk is sold in Whole Foods all across North America! • Awarded top holiday seller on Amazon.com, featured on "Best Alternative Therapy Ever" by Dr. Oz, and chosen for Oprah Winfrey’s "O" list of top products. • 1 Year Warranty, 30-day money-back guarantee. CARE: Washing: Remove the foam pad from the cover. Hand wash the cover in warm water using mild detergent. Hang to dry. Re-insert foam pad. Do not wash using a washing machine. Do not use a tumble dryer or iron. 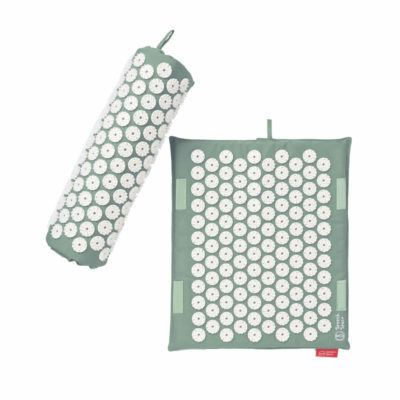 Storage: To store your acupressure mat, roll up the mat and place in the carry bag or hang the mat by the tabs in a safe place far from the reach of children. WARNING: If you are or could be pregnant, have unregulated high blood pressure, suffer from any bleeding disorder, have any type of neuropathology, are on a blood thinning medication (except aspirin), or suffer from any kind of skin inflammation/infection, please do not use the acupressure mat. 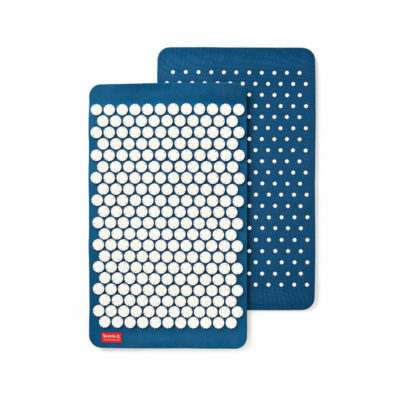 You can use the Spoonk™ mat, with appropriate caution, if you have well regulated blood pressure by medication from your doctor. If you have sensitive skin, heart failure, and/or arrhythmia (heart), or any other serious medical condition, please consult your doctor before using the Spoonk mat. If you suffer from seizures, please use the mat in the company of an adult who is capable of helping you off the mat in the event of a seizure attack. Please read the instructions on how to use Spoonk. Please read Spoonk Space Inc. terms of liability before using the Spoonk mat. Keep out of reach of children. Do not expose this product to acetone, nearby fire, direct heat, or sunlight. 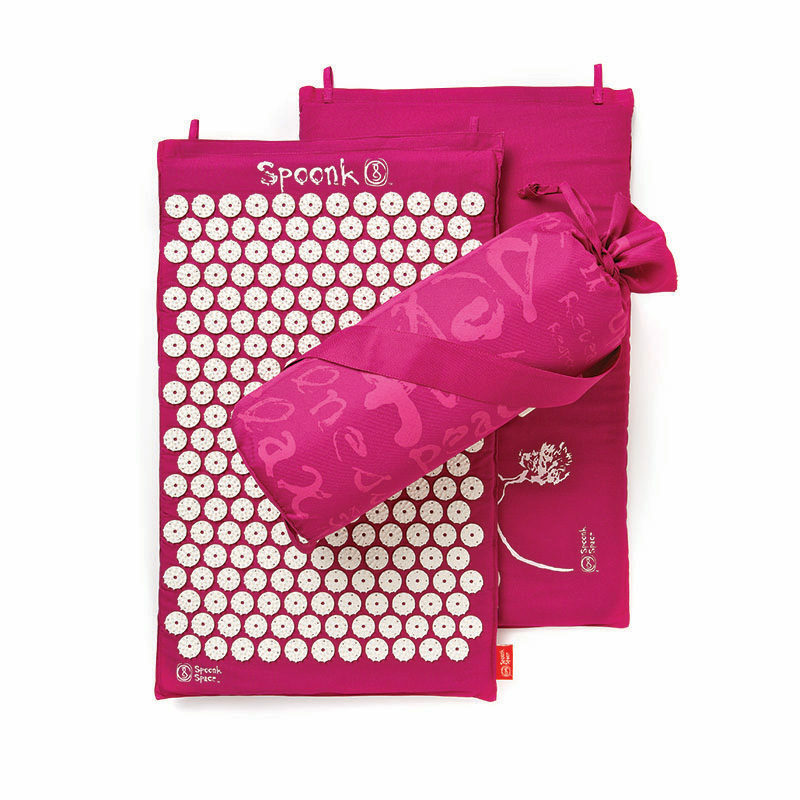 The Spoonk acupressure mat is not a cure for any medical condition. • Spoonk Mats are filled with a USA-made, high-quality, CertiPur-US Eco-foam free from fire retardant chemicals. The stimulation points are made from a recyclable, non-toxic, hypoallergenic ABS plastic, free of styrene. • Free from flame retardants: flame retardant chemicals are damaging to human hormonal balance. Flame retardant particles are easily inhaled by our lungs, and could increase estrogen levels that could be detrimental to our health and wellness. • Uses VPF technology: VPF technology is a trademarked technology used in foam production that has 0 EMISSION = 0 CARBON FOOT PRINT in production. Our foam is made using air blowing agents rather than highly toxic chemicals and is plant based.